Today my one year old and I were hanging out with my sister and her 5 month old son at her house. We were in the living room talking and the babies were playing on the floor when my son suddenly popped up and walked very determinedly down the hall. I followed him to the nursery where he looked around the room and then looked at me with a questioning look on his face as he tapped his head with his index finger a couple of times. This is his version of the American Sign Language sign for Daddy. My Brother-in-law was outside of the nursery window talking on the phone. I realized that my son heard a male voice and he was looking for Daddy. So I picked him up and we looked out the window and I said "That's not Daddy, that's your uncle. Daddy is at work right now but you will see him in the morning when you wake up." 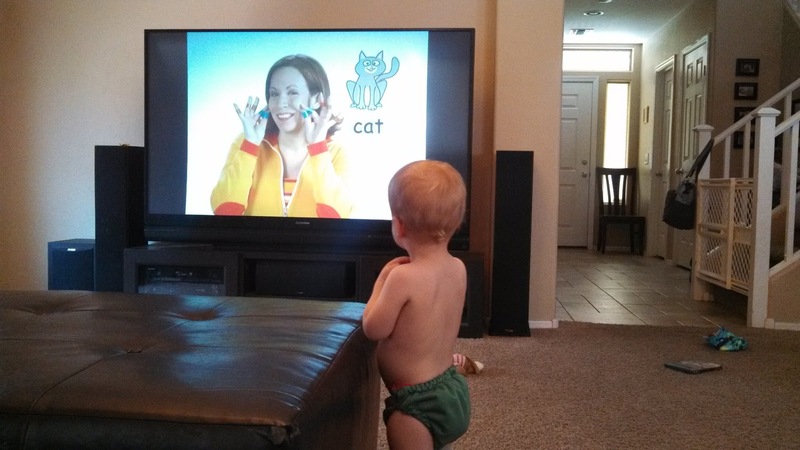 We waved at his uncle then went back to the living room to play. This is just one of many conversations I have had with my son that would not be possible without sign language. I started signing with my son basically at birth. I knew I wanted to teach my son to sign to give him acess to language and a way to express himself as early as possible. 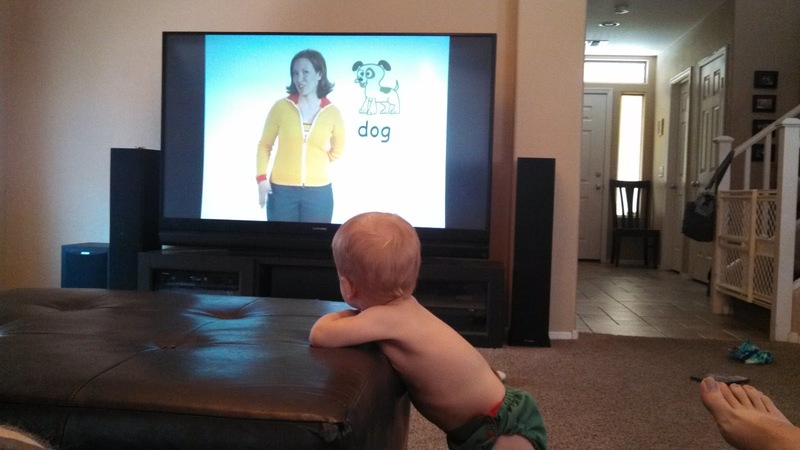 I think it is such a positive way to interact with my son even before he understood the signs. I also think it is just such a good thing for his little growing brain. To teach him to associate manual symbols with objects and concepts as well as spoken words just seems like a good mental exercise. I think it's good for my brain as well, to learn something new, a second language as well as a manual skill. But especially at his age where he is soaking up everything like a sponge. At 11 months old he started signing back in a way that I understood. (Looking back I think he may have had a few attempts before that I should have recognized and encouraged but I wasn't sure and I didn't want to get too excited over nothing. Live and learn.). He started signing MORE at meal times by clapping his hands. When he realized this got him something he wanted he started using this one sign as a general attention getter signing MORE for everything from milk, to read a story book to getting a drink of water. Slowly over the next few weeks he started to produce different signs in different situations. Now one month latter my son has a signing vocabulary of about 21 words. More, all done, baby, light, potty (if only he would sign this consistently before he needs the potty... its a work in progress), help (his current, more appropriate, general attention getter. 'help me open this box', 'help me read this book' etc. ), milk (yay! no more pulling on my shirt in public! ), bed, hat, banana, eat, drink, ball, dog, fan, wind, music, lion, shoes, airplane and of course Daddy. This is nothing short of astonishing! This is an incredible vocabulary for a one year old! There are no words for what a gift this has been for us. I am learning so much about my son and how he sees the world. One night when I went in to his room to nurse my son back to sleep after a night waking he pointed to his baby monitor and signed LIGHT and then to his sound machine and then to the fire alarm. All these devises have small lights on them to show they are on. He wanted to let me know he noticed these three lights in his room at night and wanted to know more about them. I would otherwise have no way to know that he noticed these lights and was curious about them. Shortly after my son started signing he became proficient at drinking from a regular cup. I had given him a chance to practice from time to time and make a mess all over the kitchen floor but when he started signing he started asking for a drink several times a day by using his one sign at the time, MORE, while looking at or pointing at his cup. As a result he got the opportunity to practice far more often than I would have offered otherwise. It didn't take long at all for him to be drinking from a cup like a pro. One morning when my son woke up in bed with us he signed LIGHT in the direction of the two windows in our room. We have blackout curtains but some light does sneak through at the top. I was able to tell him "Yes, that is sunlight coming in through the windows. That means it's morning and it's time to get out of bed. Let's get up and say hello to the sunlight!" The other day we were eating lunch out and my son suddenly started patting his head to sign HAT. I followed his gaze and sure enough a man had just walked into the restaurant wearing a baseball cap. He notices hats everywhere and loves to talk about them. He got a balance bike for his birthday that has been sitting in our living room. Every once and a while he will go touch his bike or sit down by it and sign HELP. "Please help me sit on my new bike". He is so cute and just looks so proud of himself sitting on that bike. I can tell he really likes it. We probably wouldn't think to let him practice sitting on it and holding it up as much as he does if he did not have a way to ask. 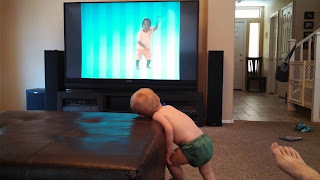 We sometimes watch the Baby Signing Time DVD's with him. 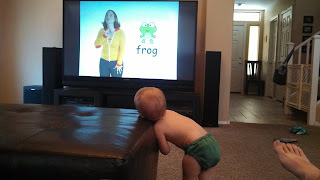 I don't think he has learned any signs just from the DVD's but we have learned signs to do with him and he likes the singing and watching the kids. He really loves it and watches very intensely. He started asking for his show by picking up the TV remote and signing BABY. Signing not only eliminates a lot of frustration for both of us now that he has a way to calmly ask for HELP or MILK or let us know he is ALL DONE but it has helped to get to know my son a little better. He surprises me every day with the things he notices and wants to talk about. I think this is so good for our relationship. I get a chance to get to know him better and he has a chance to express himself and know that his thoughts and needs are understood and valued. This might seems silly but I really think he is a happier more confident little boy now. 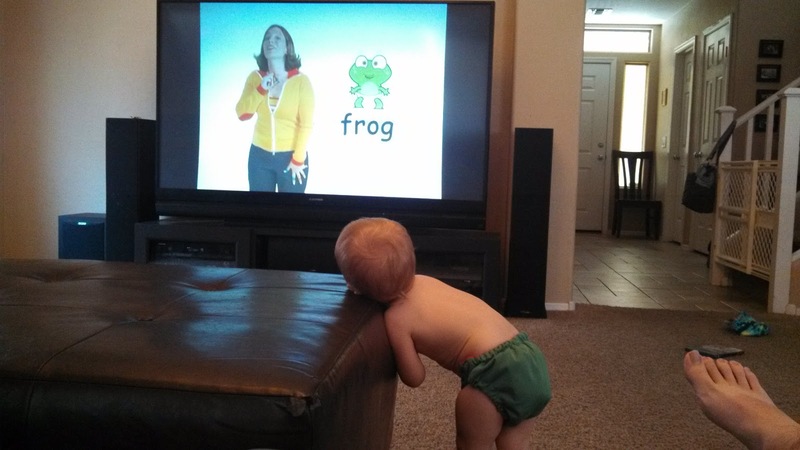 Signing gives him a source of developmentally appropriate control over his environment. He has a way to initiate conversations and experiences (talking about lights and hats, drinking from a cup or sitting on his bike) and this really helps boost his self confidence. You can really see the look of pride in his eyes when he successfully communicates an idea or need and he sees that he has been understood. It is such an amazing gift! I am so glad to be able to really communicate with my baby and get to know him better. It's going to be fun to see where this takes us and I will be sure to share more about our signing journey as we go along.